Control Joints – Quality Block Co. Inc.
All structures move when subjected to changes in moisture, temperature and loads. Movements can cause damage or cracks especially when no provisions are made to allow a structure to move. Type, location and spacing of movement joints depend on masonry materials, climatic conditions, size and type of structure, local factors and experience. • Facilitate the construction of the walls. Movement joints should never be located by chance or convenience without regard for their effect on the strength or the appearance of the completed structure. Movement joints in a wall, whether control joints or expansion joints, should match any joints built into the roof system, the floor system, the spandrel beams or other elements intended to accommodate movement of the building. Concrete masonry units are subject to significant shrinkage due to moisture loss and/ or temperature decreases. Of particular concern is drying shrinkage of concrete masonry during early curing and drying of masonry walls, which introduces tension stresses into masonry units. During construction of concrete masonry wall, causing it to expand. As grout hydrates and hardens and as masonry units dry out, a wall tries to shrink. Since face shells lose moisture rapidly in a dry climate, they shrink quickly, thus putting them into tension while interior of wall is subjected to compression. Cracking of concrete masonry units occur if these tensile stresses exceed tensile strength of the materials. 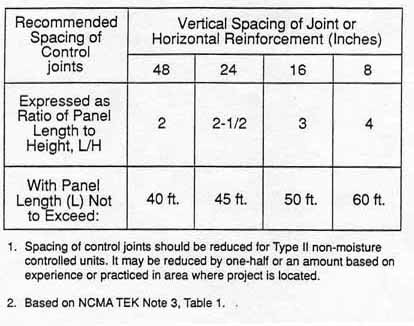 Shrinkage control joints panelize a wall, allowing shrinkage to take place within a small, relatively unrestrained panel. The panel can shorten in length allowing potential cracks to occur at the control joint. 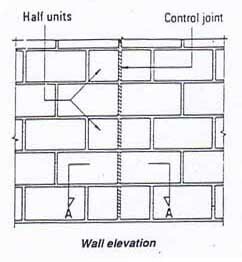 Shrinkage control joints are basically weakened head joints extending vertically straight up and down the wall through the use of full and half masonry units. Mortar at the control joint is either left out entirely or deeply raked back. 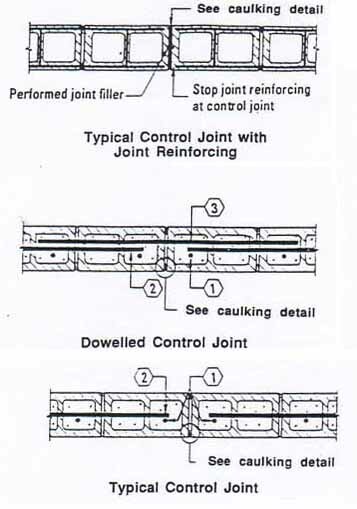 Joint reinforcing is generally terminated at a control joint, although chord-reinforcing steel at floors and roofs must continue through the control joints. Likewise any horizontal reinforcing required for structural considerations such as lintel reinforcing should continue through a control joint. Provide 4’-0” long smooth dowels across joint. Prevent bond between bar and ground with grease or plastic sleeve. Cap all dowels to allow 1” of movement. Vertical control (contraction) joints are usually spaced at close intervals so that when shortening takes place, the resulting crack will occur at the joint. It is important to provide sufficient control joints so that the movement occurs at the joint rather that midway between the control joints. © 2019 Quality Block Co. Inc..